You like wool overcoats but sometimes you want one that isn't full length. That is where a car coat length is what you should wear. Car coat length comes from the fact that in the dawn of automobiles, traditional full length overcoats were both too cumbersome to get into a car wearing the extra length wasn't necessary since you would be warmer since you were inside the car already. 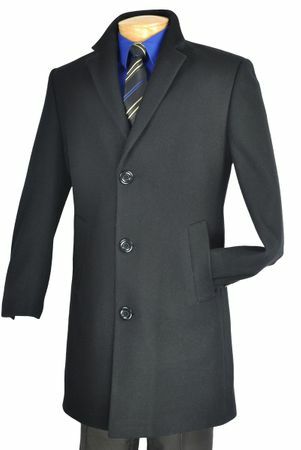 This black cashmere blend car coat comes in a single breasted style that fits mid thigh and will look great over any of the suits you already own giving you a stylish improvement with ease. Please order your exact size for best fit only. Fabric is 70% Wool/25% Viscose/5% Cashmere.